Dr. Wendy Wrieden is a member of the Food Security Advisory Group working on the “Big Picnic” project at the Botanic Garden. She is friendly and chatty with a huge amount of research experience, and our discussion flowed for almost an hour! Her first degree was actually in Botany but she then did a PhD in Food Science and over the last 15 years has been researching the Scottish Diet, work funded by Food Standards Scotland, the public-sector food body for Scotland. She enjoys working with people and studying our relationships with food. 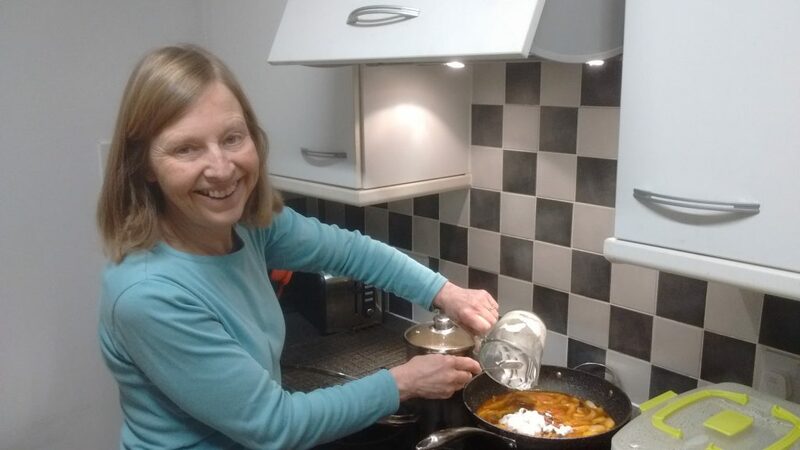 Wendy cooking a cashew nut curry. As novices in this area, we were intrigued by how she conducts her research. Interestingly, she uses purchase data to find out what households consume. Individuals keep a spending diary, so there is a huge amount of data to look at. It includes details of living costs including food, gas and electricity. She described the wide breadth of analysis that can be done. Comparing diets across factors such as age, income, gender, geographical area, number of people in the household… and many more. The analysis can be broken down into food groups, nutrients or how much households spend on different types of food. It can even be linked to information on greenhouse gas emissions to find out the carbon footprint of our food. Much of her research relates to the “Big Picnic” project on food security, as she looks at diet and index of multiple deprivation. The index is based on where people live and takes into account multiple factors such as average income, access to healthcare resource and educational opportunities in the area. There is no doubt that, as a Registered Nutritionist, Wendy knows what a nutritious diet looks like. However, like many of us, she realizes that a ‘healthy’ diet is different for everybody. There are many factors that influence what we eat and where we get our food from. Our discussion led us onto the topic of ‘fad diets’ and misconceptions. For example, in recent years, a gluten-free diet has become increasingly popular, although there is little evidence suggesting that it is better for most of us, and studies have suggested that removing gluten could even be detrimental. We discussed how her research has looked at addressing food security issues. A study that explored people’s diets before and after a series of cooking classes showed interesting results. Quantitatively, the amount of fruit and vegetables in diets did not increase. However, participants reported a sense of empowerment and positive impact on attitudes towards eating fresh food. On a larger, national scale, we circled back to an issue that has come up multiple times. Where does our food go? Agricultural production uses about 75% of Scotland’s land mass, producing meat, dairy, grains, fruit and vegetables, which are all staples of a balanced diet. However, it appears that little may be consumed by the people of Scotland. Wendy suggests community gardens are a great place to start. They bring communities together and give people the confidence to grow and eat healthier produce. Although these initiatives may be limited in reach, by building awareness around the issue of food security in local communities, bigger initiatives can grow.